This sign marks the end of a no-stopping zone, or clearway. The end of a no stopping zone or clearway zone marks the point after which you are allowed to stop. No stopping zones will be marked with a sign showing the red and blue circle and a direction. The sign could be permanent, or it could be because there are some kind of road works or event. Signs might be put up the night before a road is due to be resurfaced. If this is the case, your vehicle will be courtesy towed and you will need to contact your local council to find out which towing company has been contracted to take it. 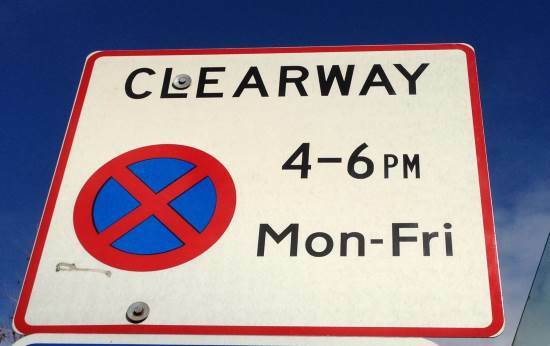 If they are in areas where traffic needs to flow smoothly at certain times, for example, rush hour, the red and blue circle and the word CLEARWAY with a time limit with be displayed. You are not allowed to park on a no stopping zone or clearway when it's in operation. If you park in a clearway during its times of operation then your car will be towed and you'll have to pay a towing fee to reclaim it. Call your local council to find out how much this will be and where your vehicle has been towed to. You will need to provide the licence plate number. For example, these are the towing details for Auckland Transport. Clearways are often enforced on arterial routes during rush hour. The sign below shows that it is in operation between 4pm and 6pm Monday to Friday. Beneath this sign (not in the photo) is a parking sign, i.e. when the area is not a clearway, it is a time-limited parking zone.